Editor's note: This is part of the weekend series of posts by guest authors, who are fellow bloggers, wine industry folk and/or Basic Juice readers. If you are interested in being a guest author, contact me with a proposal, and we'll see if we can't introduce the world to your handiwork. Guest Author: Elsbeth Wetherill, co-owner of Escafeld Vineyards, a small family operated winery located in the San Antonio Valley. E-mail her at [email protected]. Already legendary for world class restaurants, romantic hotels and breathtaking scenery, Monterey County has another compelling reason to visit—the wines. Monterey County is home to nine appellations: Arroyo Seco, Santa Lucia Highlands, San Lucas, Chalone, Monterey, San Bernabe, Hames Valley, and our newest AVA, San Antonio Valley. A wide range of microclimates, with cooler regions in the north and warm, dry appellations in the south, provide local growers and winemakers with the perfect conditions for practically every grape variety and style. The first stop on your itinerary should be A Taste of Monterey on Cannery Row, where you’ll sample wines from over 40 Monterey County Wineries, including a number of smaller boutique producers who do not yet have tasting rooms. Then pick up a copy of Monterey Bay Wine and Travel Magazine and hit the wine trail. Monterey County is home to over 25 tasting rooms, renowned as much for their hospitality as for their wines. New to the wine corridor is the San Antonio Valley, recently granted appellation status. Almost a secret, this beautiful unspoiled valley, just 20 miles inland, is home to Mission San Antonio de Padua and William Randolph Hearst’s historic Milipitas Ranch House, which is now a guest lodge and restaurant. You’ll also find some of the most stunning drives on the central coast. 800+ acres of vines and over 20 varietals are planted here, where growers and winemakers work together crafting high-quality wines. The San Antonio Valley was originally planted by Franciscan friars, who established a vineyard and winery at Mission San Antonio in the late 1700s. 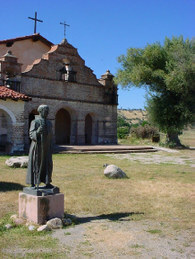 Remains of the mission winery can still be explored today. Visitors can enter the grape crushing chamber, where the must would flow by gravity down to the barrel room below. Contemporary plantings began in the 90s, by the late Johnny Gill, who recognized the valley’s potential as a world-class winegrowing region. Escafeld Vineyards is tucked into the northern sandy clay loam foothills of this highland valley, at an elevation of 980-1300 feet, where the climate is warm, with cool evenings and occasional morning fog. Daily summer temperatures often swing as much as 50 degrees, resulting in wines with full varietal flavor. Escafeld Vineyards is one of a number of small wine producers hailing from this region. Escafeld specializes in small production Zinfandel, Merlot and Petit Verdot. For more information about Monterey County wines, visit www.montereywines.org. Online: www.escafeld.com, Escafeld Vineyards; www.tastemonterey.com, A Taste of Monterey. Locally: A Taste of Monterey, Cannery Row, Monterey; Star Market, Main Street, Salinas. Both locations have a comprehensive selection and knowledgeable staff.